So here is my first DB challenge from the past. I love this recepie and for sure I am gonna bake these pretzels often. I have to work on the form, because I only managed to make one pretzel look like a pretzel. What I found strange about it the idea to serve with mustard. I love mustard, and I eat it with many different food. As a child I loved mustard bread, I still do, however I ate some grape with these fresh pretzel and those non-pretzel looking things. Amy J. from L'Esistenza Bellissima asked me if we would do the double DB challenge together. Check out her pretzels too! And here is the recepie. beautiful!! 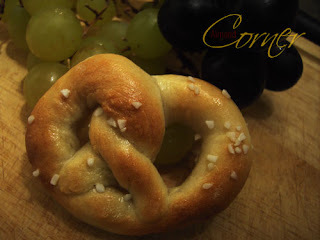 for a pretzel lover like me..this photo and recipe just made my day :-) yum! !